The term renal tubular acidosis (RTA) is applied to a group of transport defects in the reabsorption of bicarbonate (HCO3−), the excretion of hydrogen ion (H+), or both. This condition was first described in 1935 (1), confirmed as a renal tubular disorder in 1946 (2), and designated “renal tubular acidosis” in 1951 (3). The RTA syndromes are characterized by a relatively normal GFR and a metabolic acidosis accompanied by hyperchloremia and a normal plasma anion gap. In contrast, the term uremic acidosis is applied to patients with low GFR in whom metabolic acidosis is accompanied by normo- or hypochloremia and an increased plasma anion gap. The renal acid-base homeostasis may be broadly divided into two processes: (1) reabsorption of filtered HCO3−, which occurs fundamentally in the proximal convoluted tubule; and (2) excretion of fixed acids through the titration of urinary buffers and the excretion of ammonium, which takes place primarily in the distal nephron. The mechanisms for proximal reabsorption of approximately 80 to 90% of filtered HCO3− are displayed in Figure 1. The foremost processes occurring in this segment are H+ secretion at the luminal membrane via a specific Na+- H+ exchanger (NHE-3) and HCO3− transport at the basolateral membrane via a Na+- HCO3− cotransporter (NBC-1). In the proximal tubules, carbonic acid (H2CO3) is formed within the cell by the hydration of CO2, a reaction catalyzed by a soluble cytoplasmic carbonic anhydrase (CA II). The H2CO3 ionizes and the H+ is secreted in exchange for luminal Na+. This mechanism is electroneutral, driven by a lumen-to-cell Na+ gradient, stimulated by intracellular acidosis, and inhibited by high concentrations of amiloride. Bicarbonate generated within the cell leaves it across the basolateral membrane by passive 1 Na+- 3 HCO3− cotransport. The secreted H+ reacts with filtered bicarbonate to form luminal H2CO3, which quickly dissociates into CO2 and water by the luminal action of membrane-bound carbonic anhydrase (CA IV). Luminal CO2 can freely diffuse back into the cell to complete the reabsorption cycle. Both CA II and CA IV are markedly stimulated during chronic metabolic acidosis. A substantial fraction of proximal HCO3− reabsorption is mediated by vacuolar H+-ATPase. Also, about 20% of filtered HCO3− is reabsorbed by passive back-diffusion along the paracellular pathway. Figure 1. Schematic model of HCO3− reabsorption in proximal convoluted tubule. The processes occurring are H+ secretion at the luminal membrane via a specific Na+- H+ exchanger (NHE-3) and HCO3− transport at the basolateral membrane via a 1 Na+-3 HCO3− cotransporter (NBC-1). Cytoplasmic carbonic anhydrase II (CA II) and membrane-bound carbonic anhydrase IV (CA IV) are necessary to reabsorb HCO3−. Proximal HCO3− reabsorption is influenced by luminal HCO3− concentration and flow rate, extracellular fluid volume, peritubular HCO3− concentration, and Pco2, Cl−, K+, Ca2+, phosphate, parathyroid hormome, glucocorticoids, α-adrenergic tone, and angiotensin II (4). Urinary acidification takes place in the distal nephron by three related processes: (1) reclamation of the small fraction of filtered HCO3− that escapes reabsorption proximally (10 to 20%); (2) titration of divalent basic phosphate (HPO4=), which is converted to the monovalent acid form (H2PO4−) or titrable acid; and (3) accumulation of ammonia (NH3) intraluminally, which buffers H+ to form nondiffusible ammonium (NH4+). The thick ascending limb of Henle’s loop reabsorbs about 15% of the filtered HCO3− load by a mechanism similar to that present in the proximal tubule, i.e., through Na+-H+ apical exchange. It also participates in NH3 transport. Absorption of NH4+ in the apical membrane of the Henle’s loop occurs by substitution for K+ both in the Na+ K+ 2Cl− cotransport system and in the K+-H+ antiport system. The medullary thick ascending limb has a low permeability to NH3, limiting back-diffusion. A NH4+ medullary concentration gradient is generated and amplified by countercurrent multiplication through NH4+ secretion into the proximal tubule and possibly into the thin descending limb of the loop of Henle. The accumulation of NH3 in the medullary interstitium increases the driving force for diffusional entry of NH3 into the collecting tubule, a process facilitated by the high acidity of the tubular fluid at this level (5). Distal urinary acidification occurs mainly in the collecting tubules (6). In the cortical collecting tubule, the intercalated cells are involved in both H+ and HCO3− secretion, whereas the principal cells are in charge of Na+ reabsorption and K+ secretion. There are two populations of intercalated cells, which differ both functionally and structurally. The α cell is responsible for H+ secretion, and the β cell is responsible for HCO3− secretion. The cellular mechanisms involved in distal acidification are depicted in Figure 2. The main pump for luminal H+ secretion in the α type-intercalated cell is a vacuolar H+-ATPase but is also highly influenced by the luminal electronegativity caused by active Na+ transport taking place in the principal cells. A second ATPase, the H+K+-ATPase, is also involved in H+ secretion, but its physiologic role is probably more related to potassium than to acid-base homeostasis. Intracellularly formed HCO3− leaves the cell by an electroneutral mechanism involving Cl−-HCO3− exchange, facilitated by an anion exchanger (AE1 or band 3 protein). Figure 2. Schematic model of H+ secretion in cortical collecting tubule. The main pump for luminal H+ secretion in the α type-intercalated cell is a vacuolar H+-ATPase. A H+,K+-ATPase is also involved in H+ secretion. Intracellularly formed HCO3− leaves the cell via Cl−-HCO−3 exchange, facilitated by an anion exchanger (AE1). Cytoplasmic carbonic anhydrase II (CA II) is necessary to secrete H+. H+ secretion proceeds in the outer medullary collecting tubule, which is a unique segment that does not reabsorb Na+ or secrete K+ and the only function of which is the transport of H+. The medullary collecting tubule is lumen-positive, and H+ must be secreted against the electrochemical gradient via an electrogenic, Na+-independent process modulated by the vacuolar H+-ATPase. H+ secretion is not inhibited by agents that block Na+ transport, but it is influenced by aldosterone through a mechanism that is independent of Na+ delivery or reabsorption. The terminal part, the inner medullary collecting duct, also plays an important role in distal acidification. The cellular process involved in mediating H+ secretion appears to be similar to the process described in α-intercalated cells, but its quantitative importance in overall renal H+ secretion remains to be determined. All segments of the collecting tubule are very rich in cytosolic carbonic anhydrase II, but membrane-bound, luminal carbonic anhydrase IV is also present in both outer and inner segments of the medullary collecting duct. The luminal CA IV seems to play an important role for HCO3− absorption in this segment. Distal urinary acidification is influenced by blood pH and Pco2, distal Na+ transport and transepithelial potential difference, aldosterone, and K+. Aldosterone influences distal acidification through several mechanisms. First, it enhances Na+ transport in late distal and cortical collecting tubules and thereby increases the lumen-negative potential difference across epithelium, so favoring both H+ and K+ secretion. This action is first mediated by activation of preexisting epithelial Na+ channels (ENaC) and pumps (Na+,K+-ATPase) and subsequently mediated by increasing the overall transport capacity of the renal tubular cells. Aldosterone seems to be responsible of the specific localization of the ENaC in the apical membrane of principal cells of distal and cortical collecting tubules. Both early regulatory and late anabolic-type actions depend on the transcriptional regulation exerted by hormone-activated mineralocorticoid receptors (MR). However, the regulatory pathways that link the transcriptional action of aldosterone to these Na+ transport proteins is mediated by sgk (serum and glucocorticoid-regulated kinase) and other regulatory proteins (7). Aldosterone also enhances H+-ATPase activity in cortical and medullary collecting tubules, an effect that is independent of plasma K+ levels. However, the stimulation of H+,K+-ATPase also observed in states of aldosterone excess depends predominantly on the stimulus exerted by accompanying hypokalemia. Aldosterone also has an effect on NH4+ excretion by increasing NH3 synthesis, both as a direct action and as a consequence of simultaneous changes in K+ homeostasis. On clinical and pathophysiologic grounds, RTA has been separated into three main categories: proximal RTA or type 2; distal RTA or type 1; and hyperkalemic RTA or type 4. Each may occur in a varied number of hereditary or acquired etiologies (8). Recent advances in molecular biology of acid-base transporters have allowed a better knowledge of the hereditary syndromes (9–11). Proximal RTA may occur as a primary and isolated entity (12–15) or be accompanied by other proximal tubular defects (Fanconi syndrome). It may also have a hereditary origin, be secondary to administration of drugs and toxins, or be associated with a number of varied diseases (Tables 1 and 2). Stunted growth is a prominent clinical feature in children. Rickets and osteomalacia are never observed unless hypophosphatemia is present as occurs in the Fanconi syndrome. Nephrocalcinosis and urolithiasis are also infrequent, even in situations in which hypercalciuria is present (16). Hypokalemia and related symptoms are also restricted to cases with the Fanconi syndrome. Proximal RTA (type 2) is caused by an impairment of HCO3− reabsorption in the proximal tubule and is characterized by a decreased renal HCO3− threshold, which is normally situated between 22 mmol/L in infants and 26 mmol/L in older children and aduts. Distal acidification mechanisms are intact; when plasma HCO3− concentration diminishes to sufficiently low levels, these patients may lower urine pH below 5.5 and excrete adequate amounts of NH4+. However, when plasma HCO3− concentration is normalized by administration of alkali, the distal nephron is not capable of handling the large delivery of HCO3−. As a consequence, the urine is highly alkaline and contains a great fraction of the filtered load (>10 to 15%). This HCO3− wasting is a transient phenomenon, and a steady state is again maintained when plasma HCO3− concentration stabilizes in the acidemic range. It may occur as an isolated defect (e.g., mutations in the gene SLC4A4, encoding the Na+/HCO3− cotransporter NBC-1) (17) or more commonly in association with generalized proximal tubular transport defects (e.g., in the context of a dysfunctional Na+,K+ ATP-ase system). This type is caused by impaired distal acidification and is characterized by the inability to lower urinary pH maximally (<5.5) under the stimulus of systemic acidemia. The impaired secretion of NH4+ is secondary to this defect. In general, HCO3− reabsorption is quantitatively normal; however, as a consequence of the elevated urine pH, a certain degree of bicarbonaturia may be obligatorily present (<5% of the filtered load). The term incomplete distal RTA has been proposed to design patients with nephrocalcinosis or urolithiasis but without metabolic acidosis. Although these patients cannot acidify the urine, a high rate of NH4+ excretion compensates for their limited excretion of titrable acid. Some cases have been reported as a result of screening for hypocitraturia in families of a propositus with complete distal RTA (18). In children, distal RTA is almost always observed as a primary entity. Prominent clinical features include impairment of growth, polyuria, hypercalciuria, nephrocalcinosis, lithiasis, and K+ depletion. Progression of nephrocalcinosis may lead to development of chronic renal failure. If detected early in life, therapeutic correction of the acidosis by continuous alkali administration may induce resumption of normal growth, arrest of nephrocalcinosis, and preservation of renal function (19). Primary distal RTA may be observed sporadically or with autosomal dominant or recessive transmission (20) (Tables 1 and 3). Autosomal dominant distal RTA has been found to be associated in several kindred with mutations in the gene encoding the Cl−-HCO3− exchanger AE1 or band 3 protein (21). An important fraction of cases of sporadic or autosomal recessive distal RTA develop sensorineural deafness (rdRTA1) (22). There is great variation in the presentation of deafness, from birth to late childhood. Karet et al. (23) have recently demonstrated that most patients with distal RTA and nerve deafness present mutations in the gene ATP6B1 encoding the B1-subunit of H+-ATPase. Sporadic or autosomal recessive distal RTA without sensorineural deafness (rdRTA2) is the most frequently encountered primary form. Karet et al. (24) also demonstrated that this form may be caused by mutations in the gene ATP6N1B encoding the 116-kD subunit of H+ ATP-ase. In my experience, these patients may also develop neurosensorial deafness after the second decade of life. Pathogenically, distal RTA can develop when there is a true failure of the distal nephron to secrete H+ (secretory defect or classic distal RTA) or when such capacity is intrinsically intact but secondarily impaired. As mentioned, mutations in genes encoding renal acid-base transporters have been identified as causes of inherited secretory defects. The pathogenesis of acquired cases of secretory distal RTA is less known, but immunocytochemical analyses of renal biopsies from patients with Sjögren syndrome have shown the absence of H+-ATPase in the α-type intercalated cells of the collecting duct (28,29). However, in two patients with lupus nephritis and hyperkalemic distal RTA, intercalated cells stained normally with H+-ATPase antibodies (30). A defective H+-K+ ATPase function at the apical surface of α-type intercalated cells has been also proposed as a potential mechanism of disease (31), but this possibility remains highly theoretical because this transporter is more implicated in K+ than in H+ homeostasis (32). Nevertheless, deficient H+-K+ ATPase function secondary to vanadium toxicity has been suggested to be the cause of the environmental hypokalemic distal RTA present in northeastern Thailand (33). The nonsecretory defects are caused by either an inability to create a steep lumen-to-cell H+ gradient due to increased back-leak of secreted H+ (gradient defect), as observed after amphotericin B administration, or an inability to generate or maintain a distal lumen-negative transepithelial difference (voltage-dependent defect), as observed in patients with impaired distal Na+ transport (obstructive uropathy, sickle cell disease, salt-losing congenital adrenal hyperplasia, or administration of lithium, amiloride, trimethoprim, and pentamidine). Patients with distal RTA usually present with normo- or hypokalemia, but when there is a voltage-dependent defect the associated impairment of K+ secretion will lead to hyperkalemia (hyperkalemic distal RTA) (34). Another nonsecretory defect (low buffer type) is caused by reduced urinary NH4+ not caused by high distal nephron luminal pH but by low NH4+ delivery from proximal tubule to medullary interstitium. It may be observed in patients with nephrocalcinosis or chronic interstitial nephropathy of different origins (35,36). 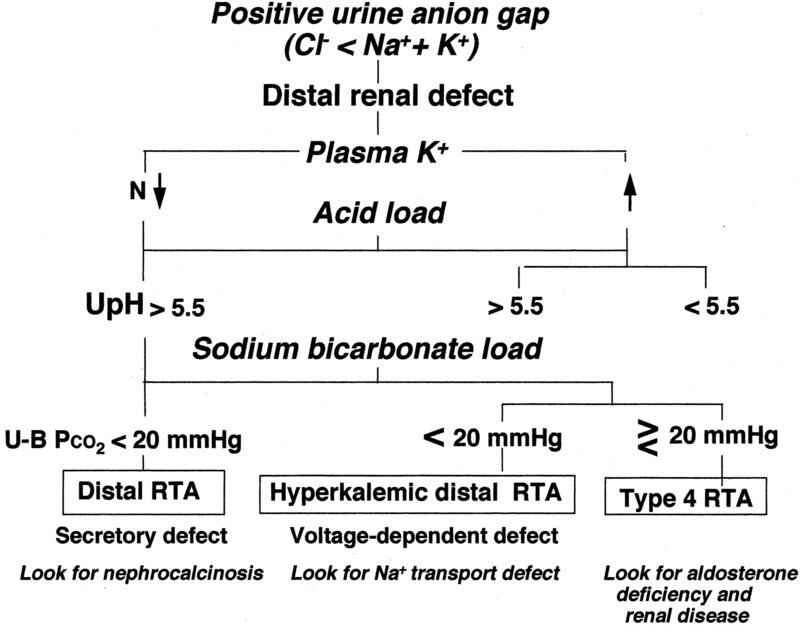 The concept of distal RTA has been expanded to include patients in whom urine pH is appropriately low during systemic acidemia but who present a low urine Pco2 during alkaline loading, as indicative of a low rate of H+ secretion. Although this defect is described in adults with interstitial nephritis or with prolonged lithium therapy (37), it may also be observed in children with apparently primary distal RTA (38). It is not yet clear if such patients have a new and different type of distal RTA or if they simply manifest a milder secretory defect. In some patients, the delineation between proximal and distal RTA is difficult to establish because they share features of both forms. In these cases, there is a striking reduction in tubular reclamation of filtered HCO3−, but, in contrast to a situation of pure proximal dRTA, there is also an inability to acidify the urine maximally despite severe degrees of systemic acidemia. This pattern (once termed type 3 RTA) may be observed as a transient phenomenon in infants and young children with primary distal RTA and does not represent a different genetic entity (39). Most cases were observed during the 1960s and 1970s, probably in relation with some exogenous factor such as high salt intake. It should be noted that this pattern of hereditary distal RTA has almost disappeared over the past two decades. Combined proximal and distal RTA is also observed as the result of inherited carbonic anhydrase II deficiency. Mutations in the gene encoding this enzyme give rise to an autosomal recessive syndrome of osteopetrosis, renal tubular acidosis, cerebral calcification, and mental retardation (40). To date, more than 50 cases have been reported worldwide. However, the majority of patients come from North Africa and the Middle East, with nearly 75% being of Arabic descent (41). All clinical findings may be explained as secondary to carbonic anhydrase II deficiency in different organs and systems. Osteopetrosis may be readily explained by the failure of osteoclasts to secrete acid to dissolve bone mineral. Renal functional studies show the presence of impaired renal reabsorption of HCO3−, failure to achieve maximally low urine pH, decreased NH4+ excretion, low urine-to-blood Pco2 difference in alkaline urine, and high urinary citrate level, all indicative of the coexistence of proximal and distal RTA (42). The acidification defect is mainly caused by impaired ammoniagenesis and is characterized by a normal ability to acidify the urine after an acid load associated to a subnormal net acid excretion due to very low rates of NH4+ excretion. Renal HCO3− reabsorption is reduced at normal plasma HCO3− concentration, but such reduction is not of sufficient magnitude to implicate an associated proximal defect. Type 4 RTA has similarities to voltage-dependent distal RTA, particularly the finding of hyperkalemia, although, unlike this condition, the ability to lower urinary pH in response to systemic acidosis is maintained. Although the decrease in NH3 production is mainly caused by hyperkalemia itself, aldosterone deficiency or resistance may also play important contributory roles (43). Hyperkalemic RTA accompanies a large number of hyperkalemic states and is most frequently observed in states of hypo- or pseudohypoaldosteronism, either isolated or appearing in the context of chronic renal parenchymal damage (Tables 1 and 4). Nephrocalcinosis and urolithiasis are absent in this disorder, and bone lesions are seen only in uremic subjects. Hyperkalemic RTA of hereditary origin is most frequently observed in children with primary pseudohypoaldosteronism type 1. This entity is characterized by salt-wasting, hyperkalemia, and metabolic acidosis in the presence of markedly elevated plasma renin activity and aldosterone concentration. In the autosomal dominant form, aldosterone resistance is limited to the kidney and is due to heterozygous mutations in the gene encoding the mineralocorticoid receptor (44). In the autosomal recessive form, aldosterone resistance is extended to many organs (kidney, colon, lung, sweat and salivary glands) and is caused by loss-of-function homozygous mutations in the genes encoding one of the three constitutive subunits (α, β, and γ) of the epithelial Na+ channel (45). A transient syndrome of hyperkalemia and metabolic acidosis, without clinical salt-wasting, has been described in infancy. Plasma renin activity and aldosterone excretion were consistently normal or elevated (46). This entity has been called “early-childhood” hyperkalemia and represents a variant of the renal form of pseudohypoaldosteronism type 1, probably due to a maturation disorder in the number or function of mineralocorticoid receptors. This hypothesis, however, remains highly speculative because it does not explain the absence of salt-wasting. Primary pseudohypoaldosteronism type 2 (Gordon syndrome) is an autosomal dominant syndrome of arterial hypertension, hyperkalemia, metabolic acidosis, and suppressed plasma renin activity. The name of “chloride-shunt syndrome” has been also proposed due to the existence of a tubular hyperreabsorption of NaCl in thick ascending Henle’s loop and early distal tubule, leading to impaired K+ and H+ secretion. Recently, it has been found that the basic abnormality is due to gain-of-function mutations in the genes encoding the WNK1 and WNK4 kinases, which probably play important roles in electrolyte homeostasis by increasing the transcellular and paracellular conductance to Cl− (47). In adults, hyperkalemic RTA often represents an acquired disorder that is observed in the context of mineralocorticoid deficiency, either as a primary adrenal disorder or as secondary to hyporeninemia in patients with mild to moderate renal insufficiency due to diabetic nephropathy, systemic lupus erythematosus, and AIDS nephropathy. It is also often seen in a number of tubulointerstitial renal diseases that are associated with attenuated responsiveness to aldosterone and defective tubular K+ secretion. Finally, a great number of drugs may induce hyperkalemic RTA. In general, RTA should be suspected when metabolic acidosis is accompanied by hyperchloremia and a normal plasma anion gap (Na+ − [Cl− + HCO3−] = 8 to 16 mmol/L) in a patient without evidence of gastrointestinal HCO3− losses and who is not taking acetazolamide or ingesting exogenous acid. The basic test for studying tubular reabsorption of HCO3− is the measurement of rates of reabsorption and excretion at different filtered loads. This is done by infusing NaHCO3 to produce slow increments of plasma HCO3− concentration and by simultaneously measuring concentrations of HCO3− and creatinine (or inulin) in blood and urine. Rates of reabsorption and excretion are plotted against the corresponding value of plasma HCO3−. The calculation of the reabsorption Tm is useless because it represents a factitious value induced by volume expansion. The simple calculation of the renal HCO3− threshold gives all necessary information for the diagnosis of a defect in tubular reabsorption of HCO3−. A practical approach for studying tubular handling of HCO3− consists of the simple monitoring of urine pH during the course of intravenous or oral administration of NaHCO3. Referring the values of urine pH to corresponding values of plasma HCO3− will permit an easy identification of patients in whom renal HCO3− threshold is diminished. HCO3− Excretion at Normal Plasma HCO3− Concentration. The demonstration of a large requirement for alkali to sustain correction of plasma HCO3− concentration at about 22 mmol/L and of a excretion at this plasma concentration or more than 15% of the filtered load is generally taken as evidence for a proximal defect in tubular reabsorption of HCO3−. However, experimental studies have shown that this approach underestimates the presence of a proximal defect because, even if such amount is rejected proximally, HCO3− reabsorption may proceed in the functionally intact distal tubule (48). In my opinion, a defect in proximal HCO3− reabsorption is better uncovered by examining HCO3− excretion when plasma HCO3− concentration is below normal levels. Urine pH and NH4+ Excretion. The measurement of urine pH is a basic step in assessing the integrity of the mechanisms of distal urinary acidification. It should be recalled that urine pH measures only the activity in the urine of free H+, which is less than 1% of the total amount of protons excreted in the distal nephron. The pH should be measured electrometrically in a fresh random morning urinary sample. A normally low urine pH does not ensure a normal distal urinary acidification mechanism if excretion of is NH4+ is low; vice versa, a patient with stimulated ammoniagenesis may have a urine pH as high as 6.0 without implying a defect in acidification. The urine pH must always be evaluated in conjunction with the urinary NH4+ content to assess the distal acidification process adequately (49,50). The urinary Na+ concentration should also be known because an elevated urine pH may be associated with low Na+ excretion without implying the existence of an intrinsic defect in distal urinary acidification (51). It should be also remembered that a high urine pH may be secondary to urinary infection with urea-splitting organisms. The urine anion gap (UAG) represents an indirect index of urinary NH4+ excretion in patients with hyperchloremic metabolic acidosis (52). The UAG is calculated by using the measured concentration of electrolytes in the urine: Na+ + K+ − Cl−. On a normal diet, the amounts of Ca2+ and Mg2+ in the urine are small and the excretion of unmeasured anions (phosphate, sulfate, organic acids) vary little. The UAG is therefore almost equivalent to the concentration of NH4+ minus the concentration of unmeasured anions. The excretion of these anions remains constant; any increase in the excretion of NH4+ during a state of metabolic acidosis must therefore be accompanied by a parallel increase in the excretion of Cl−. Thus, the UAG becomes progressively more negative as NH4+ excretion increases. When urine pH exceeds 6.5 the accuracy of the UAG in assessing NH4+ excretion decreases as HCO3− becomes a significant anionic contribution. It is important to recognize that this test is only valid when applied to situations of sustained hyperchloremic metabolic acidosis. For this reason, criticisms arisen against it should be disregarded (53). The reliability of the UAG is reduced when other measured anions (e.g., ketones) are present in the urine in increased amounts or when it contains unmeasured anions (e.g., lithium). In these circumstances, the calculation of the urine osmolal gap may be useful (UOG = Osmu − [2Na+u + 2K+u + ureau + glucoseu]), with values of urea and glucose also expressed in mmol/L. If the UOG exceeds 100 mmol/L, urine NH4+excretion is increased, although the converse is not necessarily valid if the urine is dilute. A true estimate of NH4+excretion using UOG will be UOG/2 because of ionization and equivalent counter ion (54). When the urine is highly alkaline, as occurs after a massive load of NaHCO3, urine Pco2 increases as a direct result of distal H+ secretion. H+ reacts with luminal HCO3− to form carbonic acid (H2CO3). Carbonic acid dehydrates slowly in the medullary collecting duct to form CO2, which is trapped in this area of the kidney (55). Dehydration of H2CO3 is also slow in the renal pelvis and bladder due to an unfavorable surface area/volume relationship. Provided that urine pH and HCO3− concentration increase above 7.6 and 80 mmol/L, respectively, the urine-to-blood Pco2 gradient should be greater than 20 mmHg in normal individuals. Urine also augments markedly after neutral phosphate administration, providing that urine pH is close to the pK of the phosphate buffer system (i.e., 6.8). With a urine phosphate concentration above 20 mmol/L, normal subjects should achieve a urine-to-blood Pco2 gradient above 40 mmHg (56). Transtubular K+ Concentration Gradient (TTKG). To estimate the action of aldosterone at the level of late distal and cortical collecting tubules it is useful the calculation of the TTKG index. where K+uand K+prepresent potassium concentration in the urine and plasma, respectively, and Uosmand Posmrepresent urine and plasma os molality, respectively. Normally, TTKG value is always situated above 4; however, in a hyperkalemic patient, a value <8 already implies that that the collecting duct is not responding appropriately to the prevailing hyperkalemia and that potassium secretion is impaired(57). Urinary citrate concentration represents the proportion of the filtered load of citrate not reabsorbed in the proximal tubule. As luminal pH increases, acid citrate reabsorption is enhanced; vice versa, a more alkaline urine increases citrate excretion. When the pH of the proximal tubular cell falls, citrate reabsorption is also enhanced. Therefore, urinary citrate excretion is normal or high in proximal RTA and hyperkalemic RTA, but it is reduced in distal RTA, including in incomplete distal RTA. In adults, the reference range for urine citrate excretion is 1.6 to 4.5 mmol/24 h.
Urine pH and NH4+ excretion are traditionally evaluated during spontaneous metabolic acidosis or after the acute oral administration of an acidifying salt (NH4Cl, CaCl2, arginine hydrochloride) but they can also be assessed during the infusion of sodium sulfate or, more conveniently, after the acute administration of furosemide. Both sulfate and furosemide enhance H+ and K+ secretion in the cortical collecting tubule by increasing distal Na+ delivery and generating a high luminal electronegativity in the distal nephron thus permitting the simultaneous evaluation of distal H+ and K+ secretion capacities. The furosemide test is very useful in clinical practice, but it should not be a substitute for the classical NH4Cl test, because a failure to acidify the urine after furosemide administration does not necessarily imply the presence of an irreversible acidification defect. Although furosemide may be administered orally, I prefer a protocol of intravenous furosemide administration (1 mg/kg body wt). It should be noted that the maximal acidification effect of furosemide is delayed, taking place about 120 to 180 min after administration of the drug. An advantage of the intravenous test over the oral test is that it also results in marked stimulation of the renin-aldosterone system, which is of critical importance in the evaluation of a patient with hyperkalemic RTA (56). A practical guide for the differential diagnosis of patients with RTA is given in Table 5. Appropriate attention to clinical and biochemical findings will lead in most cases to the correct classification of the patient. Also, the judicious application of the different functional tests will allow to distinguish between the different pathogenic types of distal RTA. As mentioned above, rapid distinction between proximal and distal RTA can be quickly performed by the study of the urine anion or osmolal gaps. When a urine sample from a patient with hyperchloremic metabolic acidosis has a negative anion gap or an osmolal gap above 100 mmol/L, a gastrointestinal or renal loss of HCO3− or a previous intake of an acid salt are the probable causes (Figure 3). Diagnosis of proximal RTA is established when the other disorders have been excluded. Surreptitious use of laxatives should be suspected in adults but is unusual in children. A low urinary Na+ content should indicate this possibility. Definitive diagnosis of proximal RTA is accomplished by the demonstration of a low urine pH at low plasma HCO3− concentration and by the presence of a normal urine Pco2 and a high urine HCO3− excretion at normal plasma HCO3− concentration. This diagnosis warrants a complete study of other proximal tubular functions. Figure 3. Diagnostic work-up of a patient with hyperchloremic metabolic acidosis and a negative urine anion gap. GI, gastrointestinal; RTA, renal tubular acidosis; UpH, urine pH; FE HCO3-, fractional excretion of bicarbonate; U-B Pco2, urine-to-blood Pco2 gradient. When a urine sample from a patient with hyperchloremic metabolic acidosis has a positive anion gap or an osmolal gap below 100 mmol/L, a defect in distal urinary acidification should be suspected (Figure 4). The immediate step in the diagnostic work-up is to measure plasma K+ concentration. If the value pf plasma K+ is normal or decreased, the demonstration of an inability to lower urine pH below 5.5, either after NH4Cl loading or after furosemide administration, establish the diagnosis of distal RTA. This diagnosis is further supported by the finding of a low urine-to-blood Pco2 gradient after NaHCO3 or neutral phosphate loading. In primary distal RTA caused by an inherited secretory defect, fractional excretion of HCO3− at normal plasma HCO3− concentration should not exceed 5% of the filtered load. A greater fractional excretion indicates the presence of an associated defect in HCO3− reabsorption. Diagnostic work-up should always include the search for nephrocalcinosis by ultrasonography and the measurement of urinary excretion of calcium and citrate. Figure 4. Diagnostic work-up of a patient with hyperchloremic metabolic acidosis and a positive urine anion gap. RTA: renal tubular accidosis; UpH, urine pH; FE HCO3-, fractional excretion of bicarbonate; U-B Pco2, urine-to-blood Pco2 gradient. When the value of plasma K+ is increased, even modestly, one should pay immediate attention to the value of the urine pH. The finding of a urine pH higher than 5.5 after NH4Cl loading will permit the identification of a small group of patients with hyperkalemic distal RTA caused by a “voltage-dependent” defect. The search for a distal abnormality in Na+ transport is mandatory in such cases. When the urine pH is lower than 5.5, the diagnosis of hyperkalemic (type 4) RTA is established. The presence of a moderate degree of HCO3− wasting should not induce the erroneous diagnosis of proximal RTA, which is always ruled out in these cases by the very low rate of NH4+ excretion. The remainder of the diagnostic work-up should include determination of plasma levels of renin and aldosterone and investigation of a possible underlying nephropathy. The aims of treatment for RTA are not only to correct as much as possible the biochemical abnormalities but to fundamentally improve growth in children and to prevent the progression of nephrocalcinosis and the development of chronic renal failure at all ages. The basis of therapy is the continuous administration of appropriate amounts of alkali in the form of either bicarbonate or citrate. The amount of alkali administered should compensate for the urinary loss of HCO3− plus the amount of acid generated by the catabolism of proteins and the skeletal growth. For proximal RTA, the amount of alkali required is very large (up to 10 to 20 mmol/kg per 24 h) due to the massive urinary loss of HCO3−, which takes place at normal HCO3− concentration. A mixture of Na+ and K+ salts, preferably citrate, is advised. It is important to split the daily dosage in repeat portions along day and night. Alkali therapy is bulky and unpalatable, so long-term compliance is relatively poor. Concomitant administration of a thiazide diuretic may be useful in reducing the amount of base required, but it may worsen the hypokalemia. Prognosis of proximal RTA depends on the underlying etiology, especially in cases observed in the context of the Fanconi syndrome. However, in children with sporadic isolated proximal RTA the tubular defect improves over time, and therapy can be generally discontinued at about 3 to 5 yr of age. For distal RTA, the treatment aim is to provide adequate base to balance H+ production. This production is higher in children (2 mmol/kg per d) than in adults (1 mmol/kg per d) due to H+ release from bone during the process of skeletal growth. Again, a mixture of Na+ and K+ salts is advised. The amount of base required daily per kg of body weight progressively decreases from infancy to adulthood. In young infants, as much as 5 to 8 mmol/kg per 24 h of citrate (or bicarbonate) may be needed, whereas amounts of about 3 to 4 mmol/kg per 24 h and 1 to 2 mmol/kg per 24 h are required in children and adults, respectively (39). Potassium citrate alone can also be used and, in children, an amount of 4 mmol/kg per 24 h is recommended (58). An appropriate dosage should correct successfully most of the urinary abnormalities, including hypercalciuria. Strict correction of the hypercalciuria is mandatory because urinary citrate excretion often remains subnormal and an elevated urinary saturation of calcium phosphate persists. Monitoring of urinary calcium-to creatinine ratio and of citrate-to-creatinine ratio are valuable to calculate the adequate amount of alkali supplementation required. It is important to avoid overcorrection of the acidosis because this circumstance implies expansion of extracellular fluid volume and paradoxical increase of the urinary calcium excretion. Primary distal RTA is a permanent disease, and therapy should be maintained throughout life. Nevertheless, prognosis is excellent if diagnosis has been performed early in life and appropriate amounts of alkali supplements are continuously administered. Alkali therapy restores growth in children and prevents the progression of nephrocalcinosis at all ages. However, if therapy is delayed to late childhood or adulthood progression to end-stage renal insufficiency may not be avoided. For hyperkalemic RTA, treatment and prognosis depends on the underlying cause. Potassium-retaining drugs should always be withdrawn. Hypoaldosteronism due to adrenal failure may respond adequately to replacement doses of fludrocortisone. Fludrocortisone therapy may also be useful in hyporeninemic hypoaldosteronism, preferably in combination with a loop diuretic such as furosemide to reduce the risk of extracellular fluid volume expansion. In some cases, alkali supplements (1.5 to 2 mmol/kg per 24 h) are also required (59,60). Does the Exposure of Urine Samples to Air Affect Diagnostic Tests for Urine Acidification?